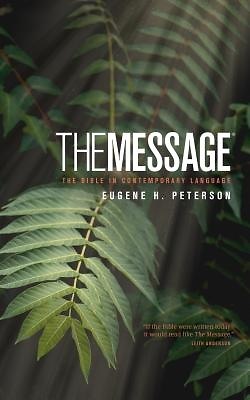 This personal-size edition of The Message is ready to go and easy to carry. In the front of the Bible, Eugene Peterson helps readers learn to use a "reading Bible." In the back, the Topical Concordance will help them find Bible passages on more than 80 topics, including doubt, anger, love, and money. With "The Story of the Bible in Five Acts," and additional charts and maps, anyone can feel at home in the world of the Bible. With book introductions at their fingertips and The Message's unique verse-numbered paragraphs, readers have everything they need to sit back and enjoy the Bible, and to hear God speak in unexpected ways.